I must confess I no longer read Gregory’s books so much for the mystery, which are not too intricate, but more for the rich social history of the period. Gregory uses real-life historical figures that she fictionally expands and her Cambridge is colourful, smelly and dangerous. And her characters are funny, hysterical and, although exaggerated, describe the many prejudices and fears that were all too prevalent at the time in a country slowly recovering from the plague. In The Killer of Pilgrims, Bartholomew is busy teaching his pupils at Michaelhouse College (later to become Trinity College), tending to his predominantly poor patients and trying to prevent any outbursts of violence between the rival hostels and colleges of Cambridge. The town has also seen a spate of robberies of reliquaries, souvenirs from pilgrimages that people keep on their person to ward off evil and heal sickness. The students of the hostels and colleges have been competing with each other with pranks that have resulted in a few deaths. The university has also organised a game of camp-ball between the Carmelites and Gilbertines for which Bartholomew will act as the official physician, a job he doesn’t relish because of the violence involved. In this busy period, a dead body is found in Michaelhouse’s grounds and Bartholomew is once again called upon by his friend and colleague Brother Michael, the University Proctor, to be his official Corpse Examiner. Put in a half-finished roof, a deluge of rain, an empty pantry and a rich evil old lady who requests Bartholomew to tend to her toothache, and you get a complicated and deadly yet very merry romp through medieval Cambridge. As always, I recommend you start right at the beginning with A Plague on Both Your Houses which sets Matthew Bartholomew and Brother Michael firmly in medieval Cambridge’s social scene. I guarantee you’ll come away with a healthy respect for today’s physicians. 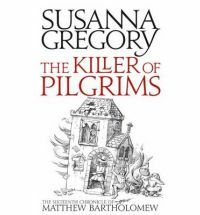 Many thanks to Little Brown who kindly sent me a copy of The Killer of Pilgrims to review. I read this for the Thriller and Suspense Challenge 2010 and R.I.P. V Challenge. have you been following ariana franklin’s historical medical mystery series as well? Mistress of the Art of Death is the first in that series. it’s pretty good, although i’m not sure if it is entirely historically accurate to have a female doctor in the middle ages. This series sounds good, but the 16 books in it all ready is a bit daunting! Eva: I hope you get to find it soon! Gregory also has another series featuring a spy named Thomas Chaloner set in London during the Restoration, but I prefer the Matthew Bartholomew series simply because I love anything medieval. Fëanor: I have read ‘Mistress of the Art of Death’ and wasn’t too sure about it. It was enjoyable but there were certain things that didn’t seem plausible (especially about her relationship and child and still being granted such freedom during that period.) But then, it is fiction so I shouldn’t grumble. However, it’s the first book and I’m planning on reading the next to see how the story progresses. Sounds like a series I need to try. I love mysteries with a historical setting, and the 14th century has been on my radar lately. I’m a huge historical mystery reader too and now there’s so much to choose from compared to 15 years ago. I also recommend the mysteries by Paul Doherty who’s one of my favourite mystery writers.